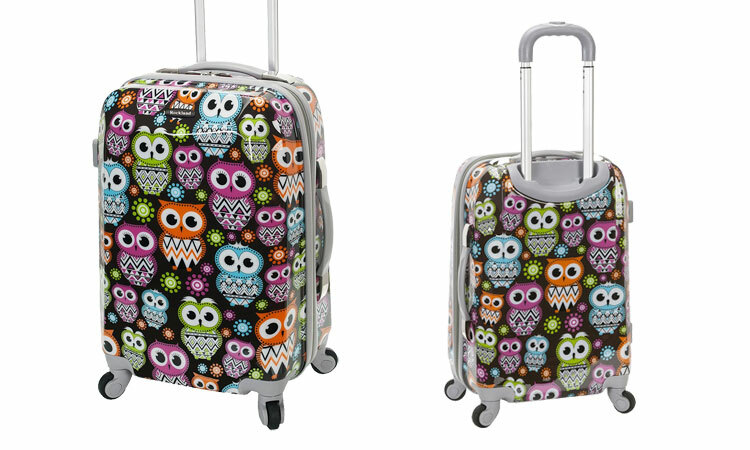 The Rockland Owl or Rockland Carry-On 20″ is a trendy and playful suitcase. It really caught my eye as the colorful design is unique and fun. I don’t think anyone could ever mistake this bag for another because it’s so different from your standard boring one color luggage. I also love that this piece of luggage from Rockland is sturdy, but not bulky. It’s lightweight and easy to manage on it’s 4 smooth rolling wheels, even when I’m racing through the airport. Check out our review on the Rockland Carry-On 20″. There are a number of popular features not present here with the Rockland Owl carry-on series. Like a TSA lock and dual interior dividers. But because the Rockland luggage comes in at such a cheap price point, we can’t knock off too many points. After all, you don’t expect all the bells and whistles at an entry price. I love how much this Rockland Carry-On stands out. The abstract playful designs makes it so unique among the thousands or more bags at a crowded airport. And there are 9 different fun patterns to choose from. Their most popular is the Rockland Owl design. There is a sturdy retractable handle on top in a nice modern silver/grey color. There are also non-retractable handles on the top and side in the same grey color. The handles seem to be very strong, and look like they will hold up well. I’m usually running through the airport because my layover is too short…or I lose track of time in the perfume store sampling the scents. So, as I’m jogging through the airport smelling like a garden, it’s helpful that the Rockland Carry-On has 4 really smooth running wheels to keep up with me. The exterior has a nice glossy finish that can be easily wiped down. Which I love because, God knows who or what touched my luggage along the way. Antibacterial wipes to the rescue! There are 9 different patterns to choose from with the Rockland Carry-On 20″. 7 are shown here. My absolute favorite colors are the owl character print and the tribal design. 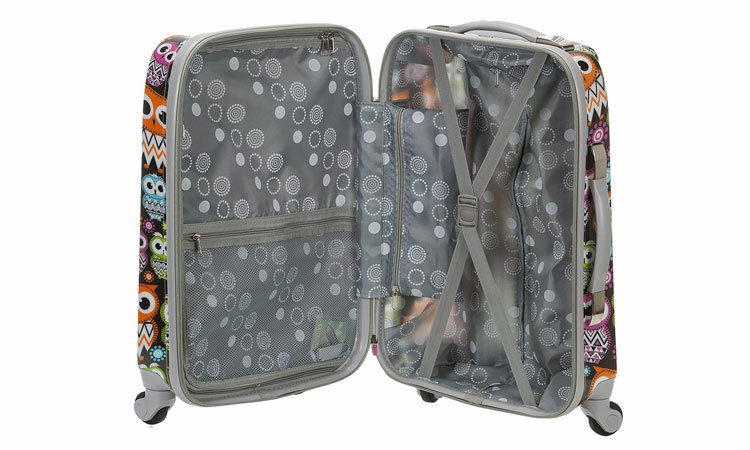 The owl design actually seems to be the biggest seller, as many sites list this product as the Rockland Owl carry-on. The owls really are so cute and colorful with big cartoonish eyes. A definite gift for my travel loving 10 year old niece! Little girls will love these designs especially if they feel they’re now too cool for Disney Princess and Barbie luggage. It’s really a look I love for me too though, as a “grown” woman. The tribal print is so trendy with it’s multicolored horizontal stripes and chevron print. A great way to be stylin’ your travelin’ girls. The snake and crocodile print are my least favorite because they are a little dark, so they don’t stand out as much. However, I suppose if someone wanted something with a bit more of a mature look they could go for the snake or crocodile prints. I would consider buying these prints for my mother though. In fact she probably already has shoes or a handbag to match! For organizing purposes, which I always need help with, I love the interior of this Rockland Carry-On. It has zippered pockets inside which helps sort things and keeps everything from shifting. On one side there is a zippered section that spans the length of the bag, so you can securely separate items. I especially like the little pocket in the middle. That’s wear I pack my underwear. Because seriously as TSA is ruffling through my bag with dozens of onlookers, I want my delicates to stay delicately tucked away. Opposite the zipped side there is a crisscross elastic band. That’s always a nice feature because when you open up the bag mid-flight, everything doesn’t go falling out. The lining inside has a fun pattern too. 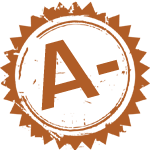 Depending on the color option chosen, the interior is either light or dark grey with little white circles. 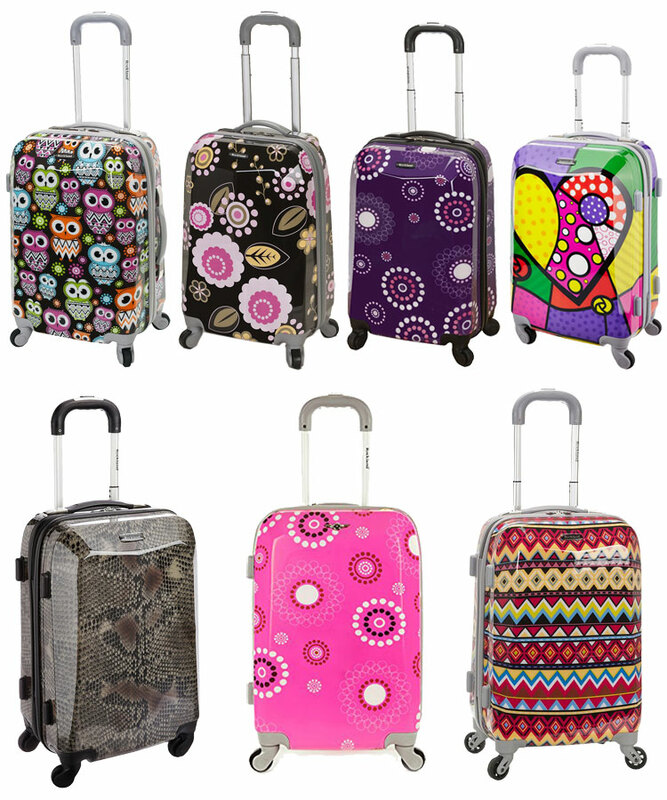 Or some of the Rockland luggage options (like the heart designed theme) are pink and white polka dots inside. Because the Rockland carry-on is so cheap I thought it might also feel cheap. But it actually feels very stable and durable. It’s made of 100% ABS, which I’ve had several pieces of luggage in the same material. It always seems to hold up well without cracking or breaking. It is carry-on luggage, which is meant for a few days’ worth of clothes. Packing more than that could cause the zipper to stretch too far and break. It seems like some have packed it too much and posted about broken zippers. But for this low price, you can’t treat the bag like a Samsonite. It should be used for what it’s designed for and not overloaded. As I thoroughly researched this carry-on I saw some people reporting that their case got scratched up easily. Unfortunately, most hardside suitcases do get scratched over time. What I like about this case though, is that the abstract patterns hide scratches easier than solid colors would. Scratches are inevitable especially with a cheaper material, but at least they aren’t too noticeable on this Rockland carry-on. Hey, it’s a small concession to save $100 over mid-grade luggage options. This Rockland carry-on starts at around $55 or so, depending on how much you catch it on sale. There is no questioning that this is an economy piece of luggage. You can’t get a piece of new luggage much cheaper than the $50 price point. An economy price often brings an economy design and bad durability. But I must say that I was pleasantly surprised at the quality of construction for such an affordable carry-on. Good job Rockland! The lively stylish options of this suit case really make it stand out in a good way. The price is really affordable and I think it’s a great value for what you get. Although it scratches easily, scratches are not noticeable because of the colorful design. The glossy exterior is probably what causes it too show scratches, but the gloss is also a plus because it can be easily wiped clean. The Rockland Carry-On 20″ is a durable hardcase spinner carry-on that does the job stylishly, while being gentle on your bank account. Even though the designs are trendy and modern, this piece is far from a novelty. I really love this suitcase and think it would make a great, affordable gift. Little girls would love the fun designs but’s still mature enough for grown-ups. The lightweight design also makes it manageable even for little ones. Also check out Rockland’s Leopard print suitcases or the Delsey Chatelet for a more subtle style.